Washington State is often nicknamed the Evergreen State. That name says it all. It is a land of lush evergreen forests, high mountains, torrential rivers and eternal rain and mist Or is it? 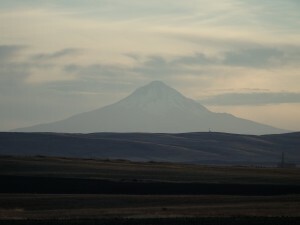 We drove there via the spectacular Columbia River Gorge heading east from Portland, Oregon. (I wrote more about it here). While following the Columbia river, which cuts through the barrier of the Cascades, we could see the landscape changing with every mile. We started our drive in a typical coastal Pacific Northwest, with greenery and waterfalls, but after less than 2 hours we were driving across windswept hills covered with dry grasses and barren basalt rocks. 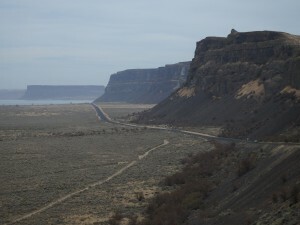 We crossed to the north bank of the river and climbed up the basalt cliffs of the gorge on US Hwy 97. 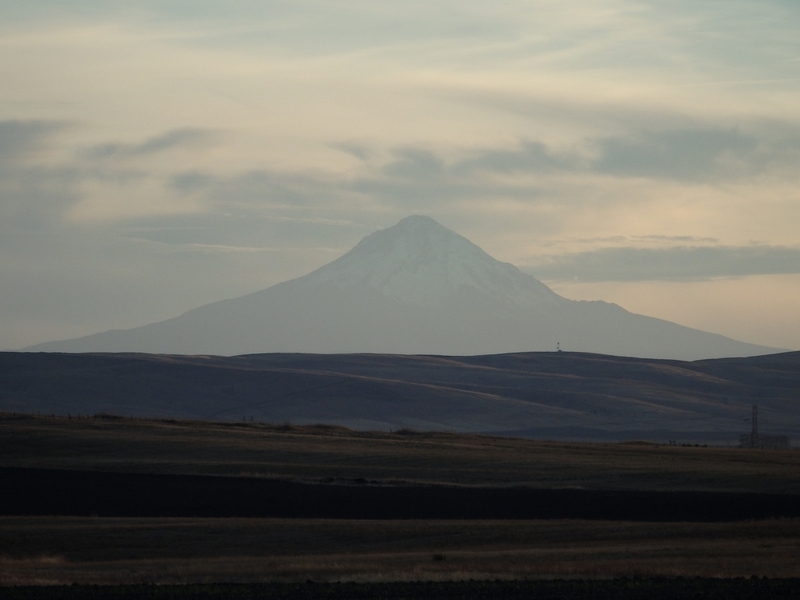 The sun was about to set so we stopped to admire the spectacular views towards the west where Mt Hood and Mt Adams were looming over the open plains. It was absolutely amazing. Moments like that are the reasons why I love driving in America. After leaving the gorge we headed towards Yakima where we spent a night in yet another chain motel in one of its endless suburbs. 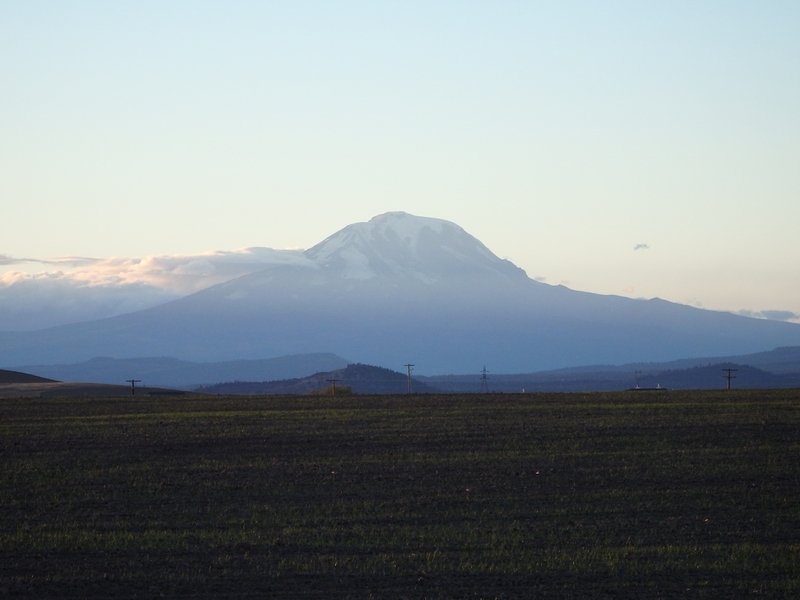 Yakima is the centre of a rich farming region producing, among other things, wine as well as hops. In fact Wikipedia claims that the valley produces most of the nation’s hops. Still, we didn’t linger and took the Interstate 82 heading north. That’s where the landscape quickly gets very spectacular indeed. The road climbs from the valley and crosses numerous ridges on its way to Ellensburg. While it is a major freeway, which is equivalent of a European motorway, it didn’t feel anything like that. The road was deserted, with very little traffic on it, and the two carriageways were often so far apart that we couldn’t see the other one. There were also excellent viewing points along the way. The first one, located at Selah Creek Rest Area soon after Yakima, offered a fantastic view of the Yakima valley and two snow capped volcanoes towering to the west: the 12,307 feet Mt Adams to the south and 14,410 feet Mt Rainier to the north. It seems like in this part of the world massive volcanoes are everywhere. 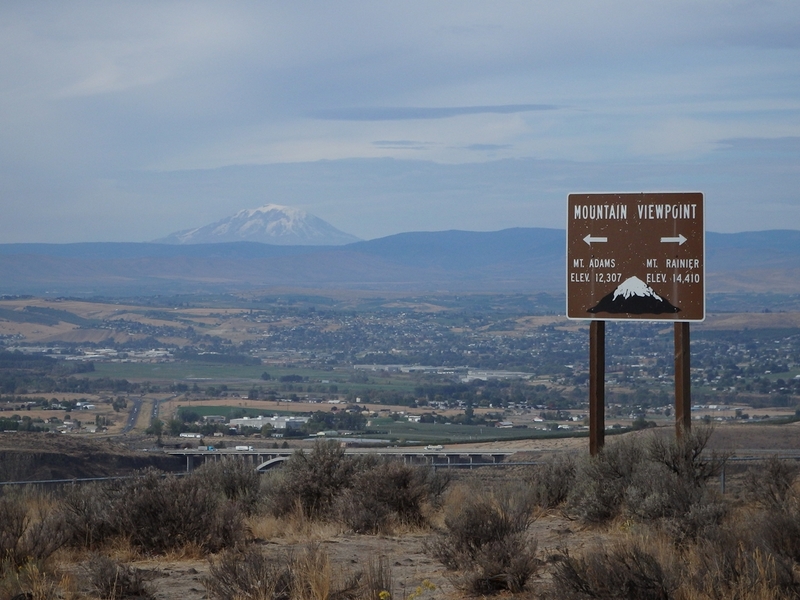 The second viewing point was close to Ellensburg and offered a splendid panorama of the town as well as Mt Rainier (again) and the jagged peaks of the northern Cascades. 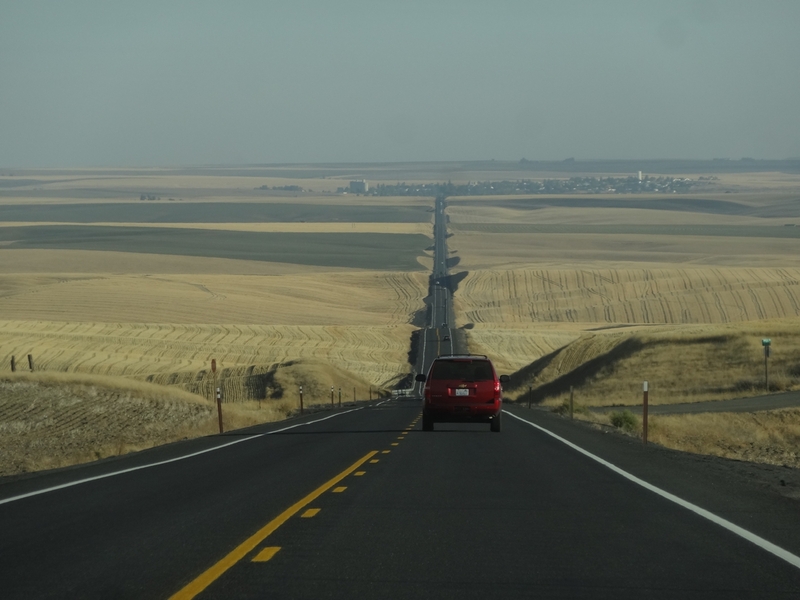 In Ellensburg we joined the interstate 90 which, at 3020 miles (4861km) is the longest interstate highway in the USA. It connects Seattle with Boston but of course we weren’t heading that far (which was a pity as I would like to cross America from coast to coast again). We followed the I-90 only until the town of George where we turned to the north. Our destination was the dramatic geological formation of Grand Coulee. Here I have to introduce a bit of geology. Don’t worry, just a bit. So, for the last two days we were driving across a broad expanse of sagebrush covered volcanic plains and valleys, punctuated by isolated mountain ranges and dramatic river systems. This barren region is called Columbia Plateau or sometimes Columbia Basin and it is one of the world’s largest accumulations of lava, covering hundreds of thousands of square kilometres to the depths of 6000 feet and more. The landscape here is relatively young as the plateau formed only between 6 million and 16 million years ago as a result of successive flows of basalt. Since then major rivers like Columbia, Snake and their tributaries have cut impressive gorges through the plains. 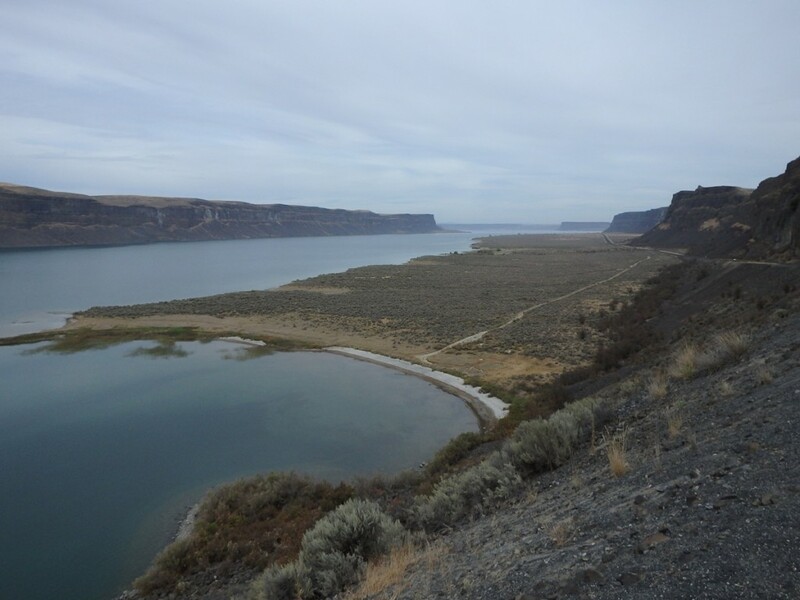 And then there is the Grand Coulee which looks like a canyon of a major river with a slight problem. There is no river in it. The mystery of the formation was solved only a few decades ago when a maverick geologist suggested that the coulee was created when a massive glacial lake was suddenly drained about 18,000 years ago after a glacial dam broke in today’s Montana. It is now a widely accepted theory and scientists estimate that this massive lake was drained in just 48 hours. The flow would have been equivalent to ten times the combined flow of all the rivers in the world. As you can imagine an event like that would leave some scars in the landscape. Literally. 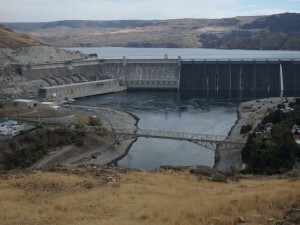 Now parts of the Grand Coulee are used for water storage and irrigation channels. Water is pumped from the Columbia River at the Grand Coulee Dam creating large Banks Lake and some smaller ones. We entered the coulee from the south along the State Hwy 17. Immediately the towering basalt cliffs, with its characteristic hexagonal columns, grew above the highway creating a truly spectacular drive. In fact Washington highways 17 and 155 are some of the most scenic roads I have ever travelled. With every turn a new panorama opened. It was impossible not to stop to take pictures. Midway through the coulee we stopped at the Sun Lakes-Dry Falls State Park which, exactly as the name suggests, is located at the site of the dry falls. The falls were created during the same cataclysmic floods which sculpted the Grand Coulee in the last Ice Age. It is a weird but scenic site. Imagine Niagara Falls without water, as if someone switched it off. In fact the Dry Falls are more than twice the height of Niagara (120 metres as oppose to 51). On top of the falls there is a viewing platform as well as small but interesting interpretive centre explaining the geology of the region. 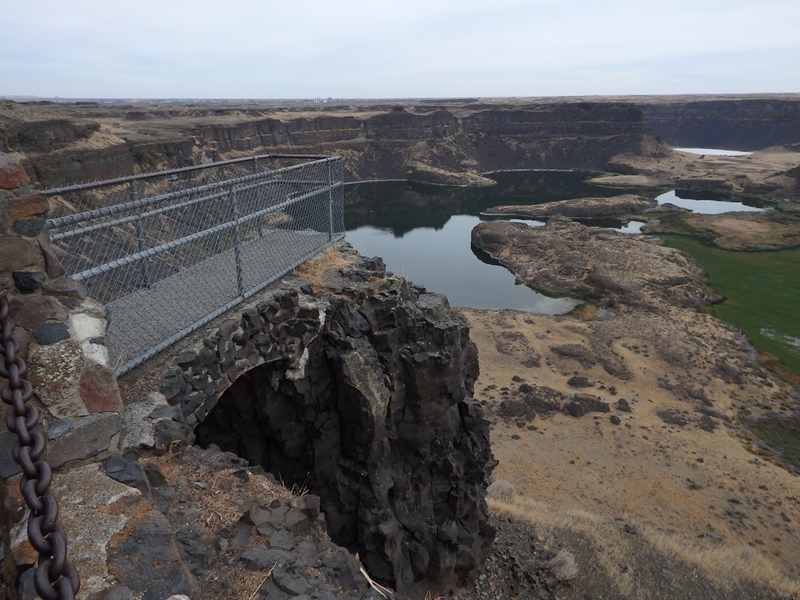 From the Dry Falls we continued north through the coulee (here filled by Banks Lake) to Grand Coulee Dam. Built between 1933 and 1942 it is still one of the world’s largest dams (it was the largest concrete dam before the Chinese finished their Three Gorges one) and the biggest power station in the US. It is a gravity concrete dam which holds the water of the reservoir because of its sheer weight (unlike the arch dams which uses their shape to spread the forces to the abutments). The dam is 120 metres tall, more than one kilometre long and contains over 9 million cubic metres of concrete. That’s enough to build a highway from Seattle to Miami. In short, it is a damn huge thing w hich I simple couldn’t skip while being in the vicinity. So we decided to join a tour. After visiting Hoover Dam a couple of years ago I was expecting a good experience but I was totally wrong. First, there was the ridiculously strict security which felt more strict than in most airports, with all the metal detectors and X-ray machine just for wallets (as bags were not allowed at all). Then during the tour we were constantly followed by a heavily armed guard. I mean a guy (in places more than one) in bulletproof armour and holding a nasty looking long gun. Come on, we were a bunch of people (some quite elderly, others quite obese) with no bags or other ways of hiding any serious weapons. I had a feeling that everyone was just a bit bored in the remote small town around the dam and hoping for some excitement. On top of that the tour itself was simply boring. We got down by the elevator to peek at one of the power rooms through the glass (again watched by a sniper with his tactical helmet on) and drove on top of the dam for a few minutes, but most of the tour was occupied by the security briefings and driving around the town from one side of the dam to another. Total waste of time. Skip it at least until they fix the glass elevator which will offer access to some more interesting areas of the dam. So the tour itself was disappointing but overall our visit to the Grand Coulee was interesting. I always liked small remote places and big structures and here we had example of both. And there is also a great viewing point on a hill a few miles out of town which offers a great panorama of the dam and surrounding small communities. From Grand Coulee we headed east towards Spokane. We took the state Hwy 174 and then joined US Hwy 2. The landscape changed again. We left the gorges carved in basalts behind and were now driving across gently undulating hills covered by huge grain farms. 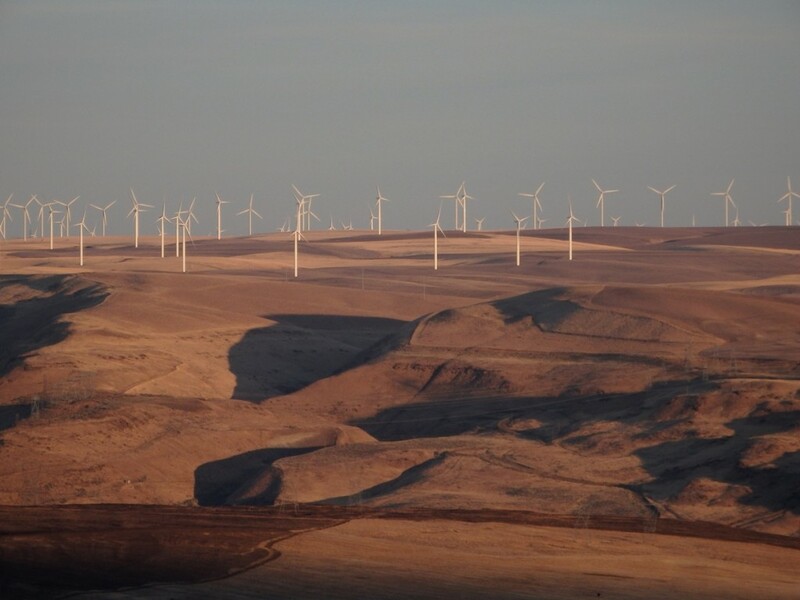 This region (together with the Palouse further south) is the breadbasket of Washington state. The dead straight roads cutting through this weird landscape created a strange driving experience, especially in the warm light of the low, late afternoon sun. It all really reminded me western Kansas. Yet one more of those moments for which I simply love travelling in the western USA. Spokane itself was a bit of a surprise. We only really decided to check it out as it was conveniently located as a place to stop on our way from Grand Coulee to Montana. 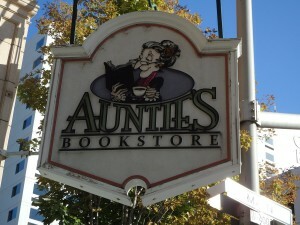 It has a small but quite pleasant downtown and we even found a very well supplied independent bookshop there. 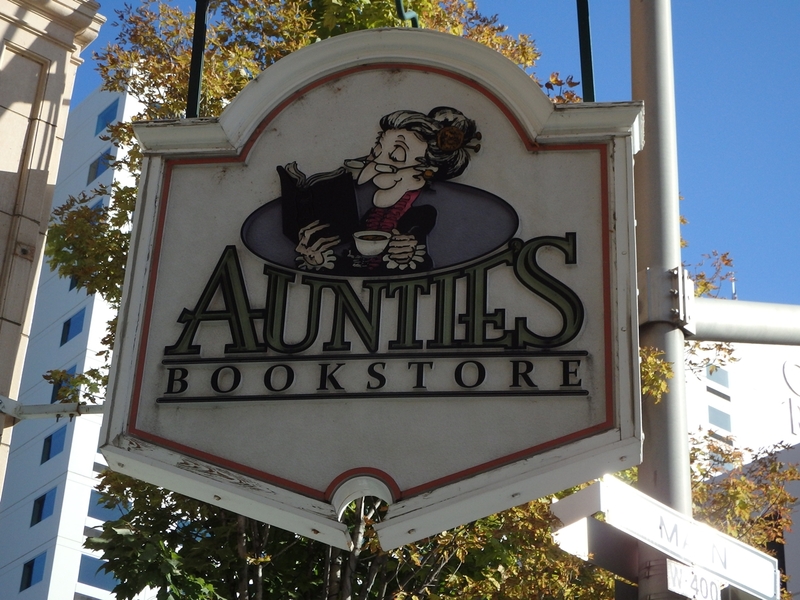 It is called Auntie’s Bookstore and it is surprisingly large considering that Spokane’s population is just over 200,000 (half a million if we include the whole metropolitan area dominated by the wast suburbs stretching all the way to Idaho, more 20 miles to the east) and the city doesn’t have a reputation even remotely close to the likes of Portland, Seattle or some university towns. Yet the bookshop seemed to be doing well and I did my bit to support it by buying quite a few books. 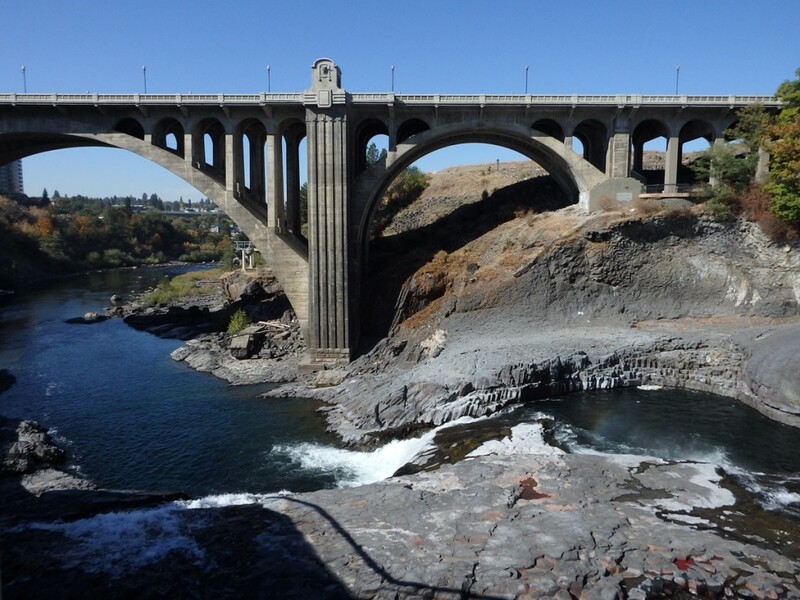 But the main attraction of Spokane are the waterfalls and surrounding Riverfront Park. Right next to downtown Spokane river tumbles 60 feet down a narrow basalt (of course) gorge. The falls consist of upper and lower falls and look very scenic and wild but they are in fact quite heavily modified by additions of dams and power stations in the first half of the 20th century. However the terrain around is nicely landscaped and one can even ride a cable car above the falls. Right below the falls there is also a beautiful concrete arch bridge offering great views for free (if you don’t want to pay for cable car). In 1974 Spokane hosted Expo ’74 and the Riverfront Park was created back then in place of railway yards. Nowadays the park and the nice peaceful downtown made Spokane a perfect stop for us. From Spokane we headed east towards Montana. The landscape changed yet again and we were now driving across forested mountains, for first time really since leaving the Cascades two days earlier. It was a clear sign that we were fast approaching Montana. In fact crossing the Idaho panhandle along the interstate 90 takes only about an hour. But Montana, covering an area larger than Germany, is a huge and varied state which deserve a separate chapter. This entry was posted in Uncategorized and tagged Auntie's Bookstore, Columbia Basin, Columbia Plateau, Columbia River, Columbia River Gorge, Grand Coulee, Grand Coulee Dam, Mt Adams, Mt Hood, Spokane, Sun Lakes-Dry Falls State Park, Washington State, Yakima on December 30, 2015 by admin.